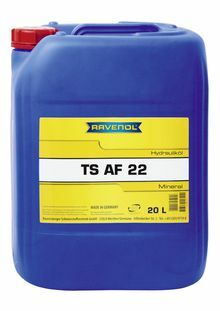 RAVENOL Hydraulikoel TS AF 22 is a zinc and ash-free compounded oil based phosphorous and sulfur intended expecially for use in the metal industry. Excellent results were achieved in the Timken test. Through the addition of selected ingredients, RAVENOL Hydraulikoel TS AF 22 has excellent wear protection, good oxidation stability and has a long service life even under extreme conditions. Compatibility with sealants is neutral. Furthermore, the additives provide corrosion protection and prevent foaming. RAVENOL Hydraulikoel TS AF 22 exceeds the requirementsof DIN 51 524 part 2 for HLP hydraulic oils. RAVENOL Hydraulikoel TS AF 22 is for use as a hydraulic fluid in the metal industry, if zinc and ash-free hydraulic oil and the specification DIN 51 524, Part 2 is required.